Are you looking for blog post ideas? Would you like some direction to inspire your editorial calendar? Although it may be challenging to come up with new blog post ideas, there’s a lot you could write about. In this article I’ll share 10 ideas to inspire your business blog content. 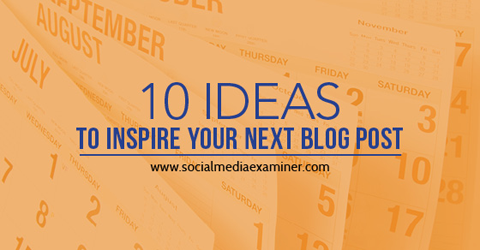 Discover 10 ideas to inspire blog posts. All businesses, regardless of industry, have their own frequently asked questions. These are either directed at the owner or manager, the sales team or customer service employees. Rather than have your team answer these 10 or 20 common questions over and over again on the phone, in person or through email, turn them into blog topics. Write a blog post to answer each of your frequently asked questions. It saves you time, while solidifying your status as an expert. Also, consider incorporating the questions into your blog post titles. This vinyl replacement window company took a common homeowner concern and turned it into a post. Answer common questions in your blog. You’ll build trust and solidify your status as an expert in your field. Answering your customers’ FAQs through blog posts is not only a time-saver, it may lead to additional sales down the road. Once you have enough common questions posts, add a FAQ page to your blog where you list the questions and link to the blog posts with the answers. Update the page as you answer more questions. How-to articles make excellent posts. First, they’ll do well in Google searches. Plus, educating your audience on how to use your product or how to do something related to your niche is an excellent way to pique their interest. 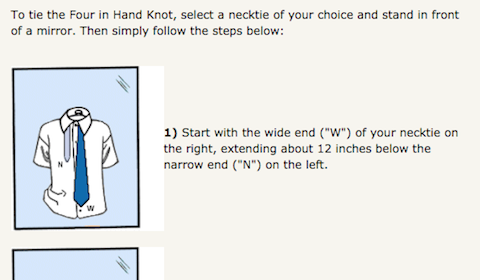 For example, this men’s formalwear company created this blog post with images on how to tie different styles of neckties. A reader who learns how to do something from you will likely return to your website for more tips. This type of post is another way to share your expertise with your current and potential customers. It’s important to limit promotional content on your blog, just as it’s important to limit your promotional content on social media. 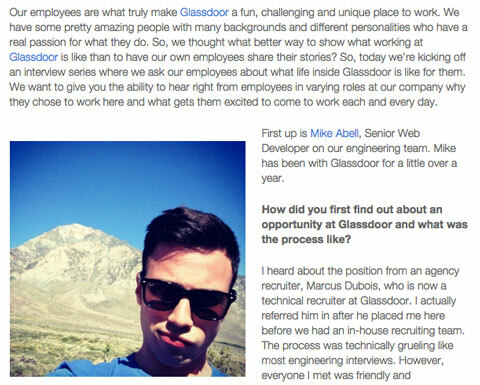 However, a blog post is a great way to share company news with your readers. Share detailed information on new hires, store openings, new products and services, sales and promotions. If your business receives an award or does company-sponsored community outreach, write about those too. Posting company announcements on your blog also makes that news more shareable on social media. Q&A posts change up your typical blog post content, while providing a more personal angle on your business, brand or industry. This Q&A–style interview from The Blueprint with Ayah Bdeir, the founder of littleBits, an open-source library of electronic modules, gives readers insight into her background and motivation. When you interview industry leaders on your blog, it gives readers extra insight into their background and expertise. There are a variety of ways to use a Q&A format for your business blog. Interview a new employee. This can be especially beneficial if you’ve appointed a new top-level manager at your business, and want to share what the changes might mean for current customers. Interview industry leaders. They can express expert opinions on significant industry happenings. Interview a happy customer. Ask him or her to share personal experiences working with your company. The Q&A format is a nice change of pace from typical essay posts for the writer, as well as the readers. Help customers and potential customers get to know the “who” behind your brand by featuring employees. This will strengthen the connection and loyalty between customers and your business. Be sure to include the employee’s picture. This blog post approach is a win-win. When you feature employees who go the extra mile or highlight their accomplishments, it also serves to bolster employee morale. To maintain your status as an expert in your field, you need to provide your readers with the latest news and information. Do product reviews to keep your audience informed. Companies are always trying to improve their products, and release the latest versions to the marketplace on a regular basis. It’s especially true in the tech world, though it does apply to a variety of industries. 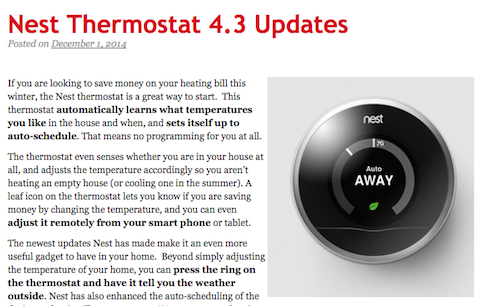 This product review from Home Theater Solutions discusses improvements made to the Nest Thermostat. It highlights the features that homeowners would find valuable. If they choose to purchase it, they can call this installation company to do the work. Review a product related to your business to help potential customers, and possibly turn them into current customers. Publishing reviews of products related to your business provides customers with valuable information on the pros and cons. It also helps them make informed buying decisions. If they choose to buy the product from you, that’s even better. Product comparisons are similar to product reviews. When customers or potential customers narrow down their buying decision to two different choices, they look to experts to guide them. Write blog posts that compare popular products to one another. 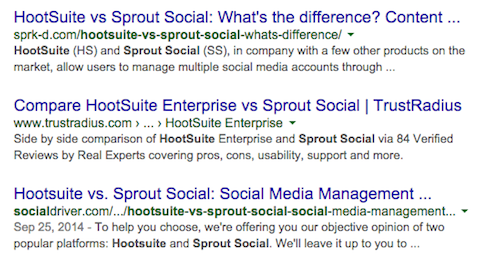 A quick Google search for a comparison between social media management tools Hootsuite and Sprout Social yields more than 22,000 results. There are many competitive products that would make informative blog posts. Blog posts discussing product comparisons aid customers in making their final decisions. If you feel like your industry isn’t exciting enough to blog about, think again. People constantly search the Internet for information on all topics that impact their lives, no matter where it lands on the “excitement” spectrum. 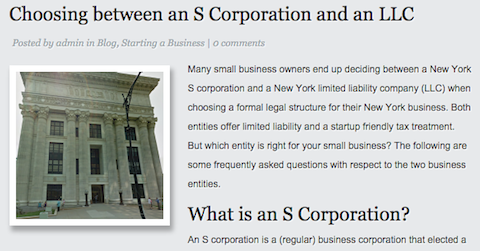 The blog post below, written by a New York attorney who specializes in small business law, is about choosing the type of legal entity that is best for your business. Scintillating topic? Probably not. Necessary? Definitely. While discussing the ins and outs of S corporations and LLCs is not exciting, it is a significant decision many business owners face. Share your expert knowledge with your readers so they can learn (and benefit) from your blog posts. People love lists. Lists concisely assemble a lot of information into one place. Whether they consist of top websites, products, resources or tips, lists serve as a resource guide for your readers. Incorporate links to your products or services, website pages or previously published blog posts into your lists. Create lists of external resources, internal links or a combination of both. One of the most recommended content marketing tips is to create more videos. Given how much time, effort and planning goes into creating just one video, it’s best to utilize that content in as many ways as possible. Each time you upload and optimize a video for your YouTube channel, copy and paste the embed code into a new blog post. 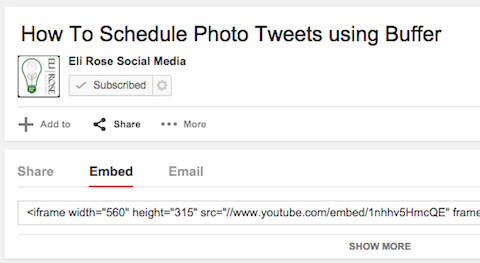 To locate the embed code on your YouTube video, click Share > Embed. Copy and paste the line of code that begins with “<iframe width” into the text view of your blog post. 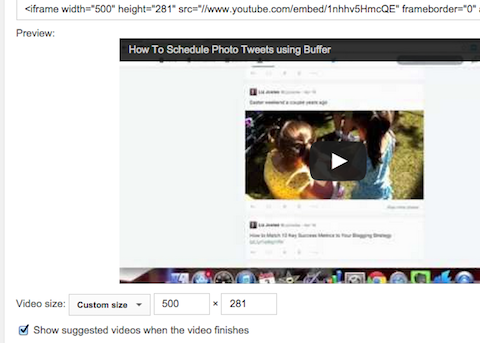 Copy and paste the YouTube embed code into the text view of your blog post. If you need to adjust the size of the video to make it fit better on your blog post,click on Show More to view custom-size fields. Make your video as wide as possible for optimal viewing on your blog. Enter the desired width into the first field. As you click out of that field, you’ll notice that YouTube auto-fills the correct height into the second field. This will keep your video’s width-to-height ratio correct. The embed code will change to reflect your new video width and height. Write text in your blog post both before and after your embedded video. 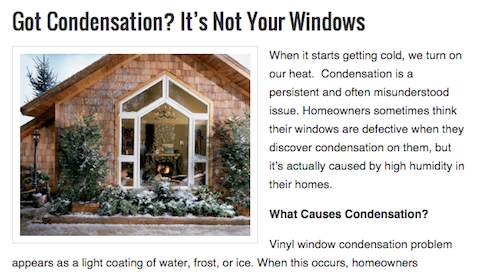 This description will add context for your blog readers. 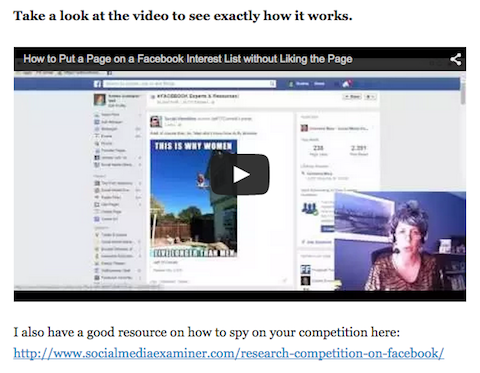 For example, Andrea Vahl did a “Grandma Mary” post with step-by-step information on how to put a fan page in a Facebook Interest list without liking the page. Near the end of her blog post, she included her video showing the same process. Add text to your video blog posts to give your readers information in multiple formats. Give videos new or extended life on your blog. Repurpose old videos and then create new ones with your blog in mind. Blogging for business has countless benefits. It’s a platform to offer expert advice and insights into your company. A business blog also gives you content and links to share on social media. Experts, use these blog post types for inspiration. Find interesting ways to share your knowledge about your company and your industry in a variety of blog formats, and you should never be at a loss for words.